Do the Dance led wire-to-wire in the featured race Friday as the Del Mar Racetrack opened its third fall season. Ridden by Tyler Baze, the 3-year-old filly finished three-quarters of a length ahead of favorite Keri Belle in the $78,450 Kathryn Crosby Stakes, paying out $28 to win, $7.20 to place and $2.60 to show in the 1 1/16-mile turf race for fillies and mares. Opening day included a salute to veterans and a fashion show. 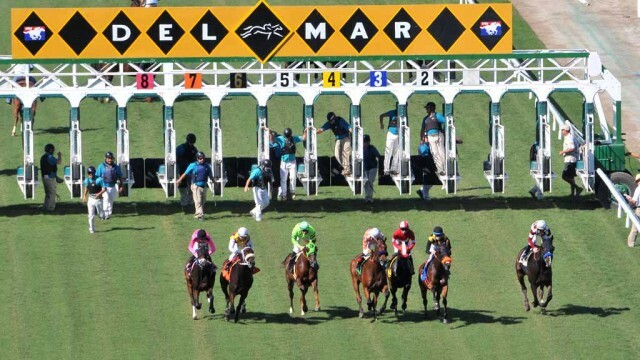 “The fall racing season at Del Mar has taken up its own special spot now on the Southern California racing calendar,” said DMTC president and general manager Joe Harper. The “Bing Crosby Season” — named for the entertainer who helped found the racetrack — will feature 15 dates of racing. After Friday’s start, racing will take place Thursdays through Sundays — through Dec. 4. First posts will be at 12:30 p.m., except for Thanksgiving Day, when racing will begin at 11 a.m.